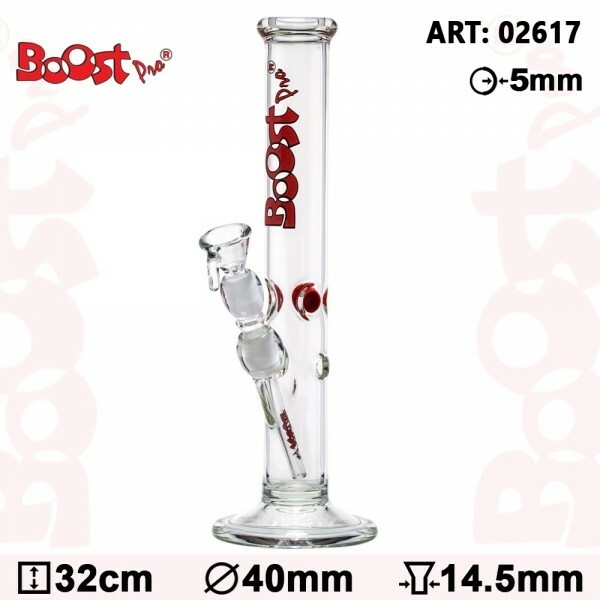 This Boost Cane Red Glass Bong is a splendid piece of glass art that will give you a super-duper hit! Some red accents are delineated upon the sturdy heat proof borosilicate glass, formed in the shape of a cane base tube. You can place your herbs upon the slide bowl, coming with a handle, for easily lifting it up and cleaning it at your convenience. The bowl connects to a detachable diffuser, for spreading your smoke into the tube, so that it gets filtered by the water. What's more, some red colored ice notches will hold a few cubes, for cooling your smoke, and a kick hole at the height of the socket will offer you the option of a different pull angle! With the red Boost logo featuring along the tube, the whole set-up ends up in a cosy mouthpiece ring.